What does being 'African' look like? Investigating South Africa's visual narratives and vernacular identity. Apartheid prevented Black South Africans from living in urban centers, and most people had to commute daily from townships far from the city to work for the predominantly white minority. After Nelson Mandela’s release in 1990, many migrated from rural communities into cities, free, in search of a new life. To survive, many newcomers to the city started as informal street traders, selling anything from single cigarettes to traditional medicines. The handmade signage that these street vendors made proves how instinctively creative they were in order to promote their services and offerings, and survive. 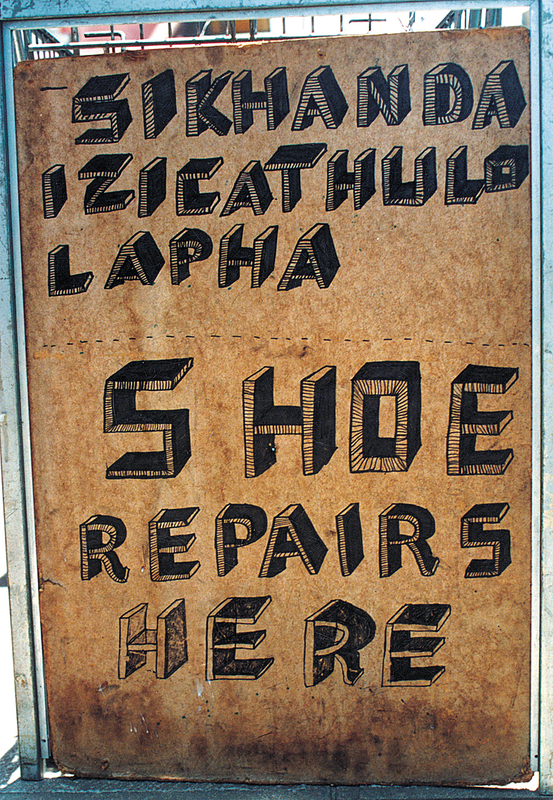 “Shoe Repairs Here” illustrates one such sign, found on an abandoned shopping trolley in front of Durban train station. A truly remarkable piece of hand-lettering, this sign marks the start of the iJusi vernacular, signifying a pivotal moment in Garth Walker’s South African image collection, now the largest collection of its kind in the world. iJusi is an experimental magazine first published in the early years following South Africa’s inaugural democratic elections, circa 1994. From the beginning iJusi posed an important question: “What makes me South African, and what does that ‘look’ like?”. Gradually, iJusi started visualising the various cultural dichotomies and social potentialities that evolved following the demise Apartheid. As was the case with the Soviet Union in 1917, a new social order begets a new visual order. Walker published the first issue of iJusi in early 1995 from his studio in Durban, then called Orange Juice design. From its onset iJusi sponsored a burgeoning South African visual culture. Subsequent issues have made invaluable contributions to the ongoing discourse about representation and identity in South Africa. iJusi is currently independantly published by Walker in a small print run, roughly twice yearly from his Durban based graphic design studio, now called Mister Walker. Despite having a print-run in the low hundreds, iJusi has developed a worldwide following. Resultantly, the magazine has reached cult status, largely due to its rarity and the fact that it has never been commercially for sale, but rather distributed gratis to anybody who sees the value in iJusi's mission. The fact that iJusi is Africa’s only experimental Art and Design magazine may also factor into its popularity amongst collectors. iJusi magazine, accompanied now by the portfolios, can be seen as testaments to a developing country dealing with various socio-economic and political stratifications. iJusi is a platform of discovery, safeguarding the wealth of talent, rich traditions, and strong sense of heritage in South Afirca. With such diverse cultural backgrounds, each with their own contribution to make, iJusi publishes the creative poignancy of a country with a visual vocabulary that remains unrivaled. Copyright © iJusi Magazine 1995-2017. All Rights Reserved. What Makes Me African - Towards a New Visual Culture.